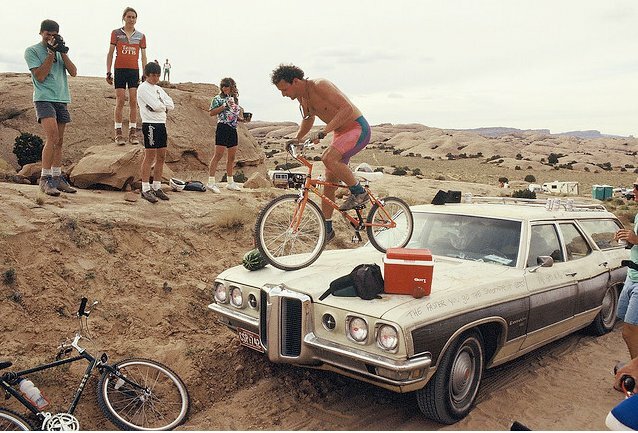 Steve Garro has been somewhat of a mountain bike legend for longer than many people have even been riding. In the late 80s and early 90s, his crew of racing and riding friends, The Mutants, were known as the wild men of the Southwest racing scene. They were as famous for jumping fires and riding gnarly slick rock as they were for racing hard against the biggest names in mountain biking. 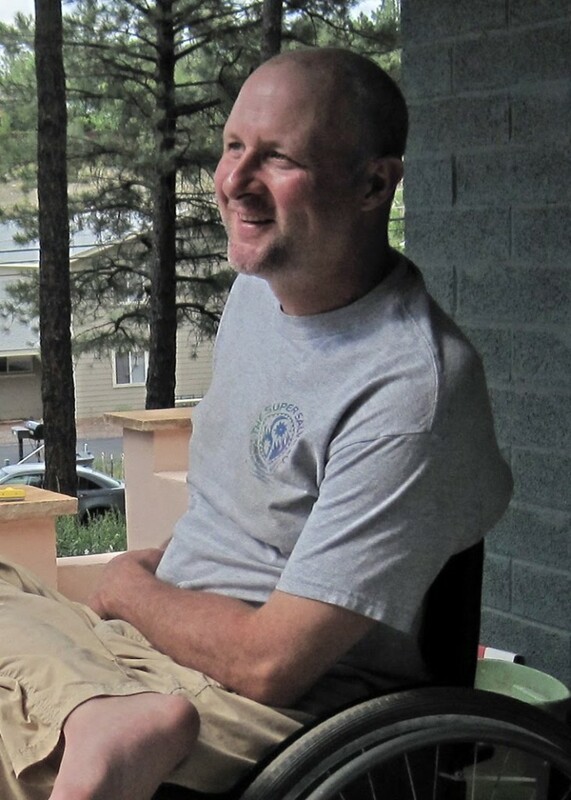 Steve later began building his own mountain bikes, launching his company, Coconino Cycles. A collision with a car in 2005 nearly took his life, but he recovered and returned to work building custom bikes of all kinds in his Flagstaff, AZ workshop. I got the chance to ask Steve questions via email about his early use of bikes to get out into the wild, his racing days with The Mutants, his frame building, and much more. I’ve read that cycling was your primary means of transportation on the reservation you grew up on. What was it about riding a bike that you loved so much as a kid? Well, other then walking it was the only was to get from A to B basically – it was a very small town – Tuba City, Arizona. I didn’t have a huge peer group, so I would ride my bike into the high desert and shoot bows, fish, track animals, and look for ruins, springs, and arrowheads. I grew up outdoors and often by myself. I’ve always been very independent. I was out on my own at 16 years old and have traveled the world to places like Peru and Bolivia where I really needed to tap into my outdoor skill set. You and your friends made a big impact on mountain bike racing in the late 80s and early 90s. What were the Mutants all about and what are some of your favorite stories from those days of racing? We were just a set of mountain bike-loving vagabonds. We never thought anything of it, but we knew we were different, hence the moniker. There are so many stories, many not fit for public consumption. We just set out to have the best possible time we could! We were lucky to get to line up with some true legends: Overend, Tomac, Herbold, Worley, Tout, Price, Matthes, DeMattei, Juarez, Weins, the list goes on & on. I’ve been here doing the same thing throughout every major leap in mountain bike technology and that’s pretty cool if you take it in for a moment. Steve in The Mutant Days circa 1988. Photo from Steve’s Blog. I’ve heard that you’ve gone your whole life without a drivers license. Is that true? If so, was it a conscious anti-driving sentiment, a lack of need to drive, something else? Now, I’m honestly too tired to want to drive anywhere. I do my work and hang with my wife. We get it all done. She is as much Coconino Cycles as me, we are a team. I guess I would counter that question with “What makes people need to drive so much?” I just rode my bike. How did you learn how to build frames? How did you transition from there to starting Coconino Cycles? Where does your company’s name come from? I live in Coconino County. I have been working on bikes for 23 years, so it’s just a natural progression. I worked at a shop (Professional river outfitters) making aluminum white water rafting frames, so I combined the two. And I did go to UBI for a frame building course, but it’s more then all that. It’s a lifetime conglomeration of everything. I’m also a third generation metalworker. It seems like there’s been an explosion of new frame builders and boutique companies in the last several years. Has this glut of other builders had an impact on your business? What do you think its effect will be in the long term? There was, but alot of those guys are either gone or marginalized. People want what I make and only I can do that, so it’s not even something I think about. Hold your line, be yourself, do the best job you can, don’t worry about other people and work hard. Steve on his Mike Augspurger-built handcycle. Do you have a favorite type of bike you like to build? Nope. I love them all equally and every person is different, so it’s always new to me. That being said, most of my bikes fall into three basic types, although some bikes blur the lines between the three as well: mountain bikes, dirt roadsters, and world touring bikes. Are there any bikes you’ve built in the past that stand out as your favorite for some reason? It’s cool to see bikes you built months or years ago, though. I get so engrossed in the current project that I forget the details and subtleties of each, so it’s like seeing it the first time all over again. Who’s frame building work did you look up to or had an influence on you when you were getting started? Rock Lobster, Cook’s Brothers, Ignatz Schwinn, Retrotec, Joe Breeze, Fat City, Paul Brodie, Chris De Kerf, Rick Hunter, Vulture Cycles, Mountain Goat, Ritchey, Ibis, Moots. And who do you respect among your current colleagues? All the guys above who still do it plus Carl Strong, Dave Kirk, Ant Bike Mike, Darrell Lewellen, Sean Walling, Dave Anderson, Steve Potts, Richard Sachs, Mike De Salvo, and a whooooole bunch of other guys who toil at the bench every day. What happened with your accident? Was it difficult to return to cycling and frame building as you recovered? I was crushed by a car. I spend most of my time in a wheelchair now as walking is slow and painful. 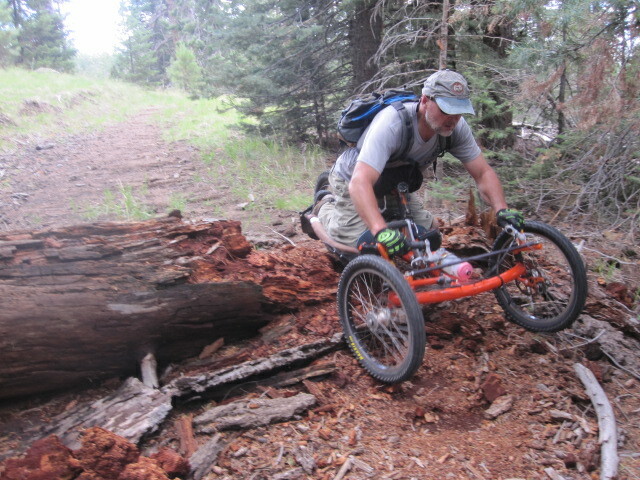 I ride an off road handcycle made by One-Off’s Mike Augspurger. I never rode a two-wheeler again. It’s just something bad that happened, I picked up the pieces and moved on. I don’t let it define me, but it made me grow as a person. Was it difficult? Yes. Everything is. What’s next for you and Coconino? Keepin’ on keepin’ on. I have worked long and hard to be a known quantity. This entry was posted in Bike Industry, Frame Builders, Interviews, Mountain Biking and tagged arizona mountain biking, coconino cycles, custom mountain bikes, mountain biking legends, steve garro, steve garro accident, the mutants. Bookmark the permalink. Garro is the man! Years ago I would spend hours and hours in his shop learning all things bikes and music, hell I still have a set of wheels he built me and the Paco de Lucia, John Mclaughlin, and Al di Miola CD he gave me. Passion and knowledge is a great way to describe Steve, I’m glad to hear Coconino Cycles is doing so well. I think I might just need a frame built soon….sounds like a good excuse to get back down to Flag. Steve is like a Spartan warrior. He builds really great bikes, too. I LOVE my Coconico and the Garros too! Great interview, Josh! I absolutely LOVE my Coconino. I’ll be heading out the door to ride to work on it in just a few minutes. Steve Garro rocks!! Garro is one tough s.o.b. We had a four man team at the 24 hours of Old Pueblo, I was the fourth rider out. Garro passed me like I was standing still, he was doing it solo single speed!